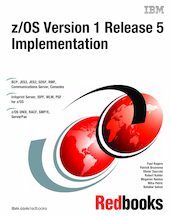 z/OS Version 1 Release 5 offers a number of enhancements that improve availability, scalability and performance, application flexibility, and ease of use. In this IBM Redbooks publication, we describe these functional enhancements and provide information to help you install, tailor, and configure this release. We also provide RMF Performance Monitor metrics and describe the system trace entry created in the system trace table for the high virtual storage service IARV64. This book is intended for systems programmers and administrators responsible for customizing, installing, and migrating to these newest levels of z/OS.